There is nothing more frustrating than riding a horse that is as solid as a proverbial rock, and having issues and misbehavior suddenly crop up from seemingly nowhere. It seems incomprehensible that a horse that used to hunt the barrel and curl around it perfectly, is suddenly throwing his nose up and stalling out on the backside. Itâ€™s virtually crippling when a horse thatâ€™s been there, and done that suddenly develops an attitude at saddling time and is cinchy as all get out. The misbehavior is frustrating, but according to Darlene Kasper more than he is â€œacting outâ€� . . . your horse is trying to communicate with you. Darlene Kasper is a two time NFR qualifier and Oklahoma City BFA Reserve World Champion. Sheâ€™s won the Speed Horse Derby, and is a six time Texas Circuit Finalist. Her horse Top Tally is an AQHA Horse of the Year, as well an AQHA Reserve Champion. Darlene attributes her and Tallyâ€™s success to her barrel racing team, consisting of her veterinarian, her chiropractor and her farrier. Together with that team Darlene has gotten to know her horse, and understand the communication that only he can provide when something isnâ€™t right. In this video, Darlene discusses how she gets to know her horses and how that familiarity with them has led to success in the arena. In addition to discussing the close working relationship between her veterinarian, chiropractor and farrier, Darlene demonstrates several exercises that she uses to keep her horses healthy and well adjusted both physically and mentally. The conversation about bit selection is interesting, and again harkens back to the one all important theme. Know your horseâ€™s weaknesses and strength, know his limitations and potential, know your horseâ€™s signs of communication, and make adjustments accordingly. This video is suitable for intermediate to advanced riders with at least average riding ability, as the concepts do require some previous knowledge. The exercises presented here are suitable for horses with a basic riding foundation as well as horses with advanced levels of training. The video addresses veterinary, farrier and chiropractic care, equipment selection, starting a young horse on the pattern, issue resolution for specific barrel racing ailments, and communication between horse and rider. Charlotte Cunningham returns to Winning Tips in this installment and takes the concept of communication a step farther in her discussion and demonstration. This monthâ€™s Tip is to ride your horse to his or her actual and demonstrated ability, not based on some fictional time line that may not apply to your horse. Her frank discussion about training levels as they apply to horse at different ages is informative. 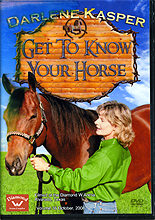 Additionally, sheâ€™ll help with the all important concept of getting your horse working off his hind end.